Basara Nekki is perched on top of his Fire Red VF-19 Valkyrie and wonders out loud what he has to change in his singing so that the people in Battle will listen to his songs. Mylene wakes everybody up in the building with her excitement in the news that the band is performing at the Super Nova event. In her excitement she mistakes Basara's room for Ray's room and disturbs him instead. Basara however doesn't feel like performing at the Super Nova concert. Mylene tells him that its because they have to use his Valkyrie in the act that he doesn't want to go. Basara however will only sing when and where he wants to sing. Fire Bomber was also able to get in the concert because of the Red Valkyrie's growing popularity, having been seen joining in the two battles. Ray gives him a piece of paper that has the song they will perform, this therefore settles the argument, as Fire Bomber is going to perform at the event. Mylene also tells Basara that he has no choice because she had his Valkyrie already shipped to the event already. Which pisses Basara off further. Ray and Mylene goes ahead to the concert in Ray's van, leaving Basara no choice but to take the train to get to the concert venue. In the train that Basara is riding, the news show Capt. Maximillian and Mayor Milia being interviewed with regards to the two attacks that were held off by the military. Milia initially starts off by praising Max then starts castigating her estranged husband (and father of Mylene) on the Military's shortcomings in informing the Mayor's office of the battle. Max also downplays the news that the Military had taken a lot of casualties during the two encounters. Akiko, Super Nova's organizer, watches the unloading of the Red VF-19. A fellow organizer asks her if she thinks its ok that an unknown band as Fire Bomber be allowed to play in this prestigious concert. Akiko however tells him that everybody started out as unknowns in the beginning and that the band has some fame with them already it because of the exploits of the Red Valkyrie. Mylene and Ray stop at a corner to pick up Veffidas. Mylene sees both her parents on the news and she comments that the two haven't changed because they are still fighting against each other. The moderator suddenly shifts gears as the two's discussion escalates and asks whether they have really divorced. Milia however says that its just a rumor. Max ends the interview by saying that he has to return the bridge, Milia also says that she has to go. Bridge operators Miho Miho and Sally were watching the interview and Sally comments that it could be really true that they have already divorced. On the way to the Concert Hall, Basara tries to break up two rival gangs who are about to go at it because of their arguing which band is better. Basara tries to placate them by singing to them the song "Planet Dance." At the concert venue an organizer tells Fire Bomber that since they're not complete they should get another member from another band to sub for the missing Basara. He also tells them that they won't really be noticed because the people will be looking at the Red Valkyrie instead of them. Akiko comes up and tells them that she will wait one hour for them while letting the other bands play ahead. She said that next time she won't do this again if they come late again. Ray tells her that she's turned kinder since they last met. It is here we find out that Akiko and Ray know each other. Mylene runs out to look for Basara. She finds him singing to the two rival groups who have since vented their anger from each other to Basara. She sees Basara singing while dodging punches. In the course of trying to break the fight they get mad at her for getting in their way and one of them pushes her to the ground. Just as Mylene is about to get hit Basara decks the guy. He is forced to fight off the rest of them. He scolds Mylene, that because of defending her he had to end up using force. He says that he only wants to resolve conflict by singing. Mylene however just asks him what the heck he's talking about. Their conversation gets ended upruptly with the gang joining together to beat them up. Ray arrives just in time with his van to spirit them off. Ray asks him if he saw already the song on the piece of paper that he gave him. Basara tells him no. Ever prepared Ray hands him another piece of paper. Basara tells him that he's in no mood to play but gets surprised with the contents of the paper. Ray tells him that they're playing the song that he composed in the last episode. Mylene tells him that she practised hard on that song. Basara's disposition changes to one of elation. An enemy ship de-folds 2000 km away from the rear of the Macross 7 fleet. Exsedol notes that they must be up to something because their distance is quite far off from their normal attacks. Max agrees and puts Diamond Force on standby while letting other squadrons intercept. Fire Bomber comes out on stage and the two gangs who wanted to beat up Basara are surprised that he's on stage. Basara's Red Valkyrie is kneeling behind them as they play. Basara asks the crowd to listen to his heart and starts playing "My Soul for You." The crowd however do not like their song and boo them. A new enemy cruiser de-folds 300 km from the Macross 7 fleet and Exsedol comments that this is probably the main attacking force. Max orders the scramble of Diamond Force to intercept them. Fire Bomber's song is cut short with the attack alarm and the crowd is asked to leave through the safety exits. Basara tells the rest of the band that he'll continue the concert from outside. To which Mylene objects once again. Veffidas starts playing her drums and this gets some of the concert goers to stop from running towards the shelters. The two gangs that Basara fought with are surprised that he's going to do something stupid as go out during the middle of a battle. 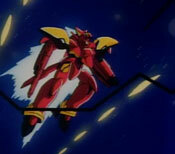 Gigil suddenly notices that some of the members of his squadron are heading towards Macross 7. He asks why they are going there and they respond that they have been ordered by Gepelnich. Ray once again hacks into the military channel and displays Basara, singing to the enemy while dodging enemy fire, onto the concert hall screens. The gangs and other concert goers are impressed with what Basara is doing. Even Akiko expresses delight with Basara's performance. Gigil tries to shoot him down but Basara just dodges his fire. Gamlin once again flies out to Basara and tells him to get off the battle area. His squadron leader, Lt. Kinryuu, gives him a direct order this time to not bother with him and to continue fighting the enemy. An underling reports to Lord Gepelnich that the team had successfully infiltrated Macross 7 and will commence with the next part of the operation once their vessels have retreated. He contacts Gigil and tells him to pull back because the operation is complete. Gigil doesn't understand how it could have been completed, then he gets mad because he realizes that Gepelnich had used him as a decoy. Basara heads back to the stage in his Valkyrie. Mylene and Ray welcome him back. Basara looks disappointed but Ray tells him not to be and points to the concert goers who stayed behind and are now clapping for him. Some of them tell him that they'll come back to his next concert and another that he likes his song. Even the two gangs he beat up express admiration for Basara. Basara say's that he'll do better next time.